With the rising popularity of home improvement shows that feature crafty DIY projects, more people are braving the DIY option for kitchen renovations as opposed to hiring professional kitchen installers. While this can certainly be a fun, exciting, and oftentimes cheaper route for experienced DIYers, there are certain times where this option can end up causing more headaches, costing more money, and doing more damage than the alternative. So how do you know when DIY is appropriate, and when you need to hire professional kitchen installers? In this article we share everything you need to know so you can avoid a costly DIY disaster! When Do You Need Licensed Kitchen Installers? Quite often, the successful DIYers are the ones who actually hold licensed trade qualifications themselves. When it comes to plumbing, electrical wiring, appliance handling or cabinet making, a successful DIYer will either hold licenses in at least one of these major areas, if not more, and/or have licensed tradespeople they can call on if they run into trouble. You may think that your kitchen renovation project is minimal enough that you do not require licensed kitchen installers. However, this could end up being a costly assumption. Why? Quite simply, you may think certain tradespeople won’t be required, however more often than not, you will come across challenges you hadn’t anticipated that go beyond your expertise. When this happens, you will need to call an external tradesperson to help you deal with this problem… which can end up costing more money and delaying your project if you haven’t pre-planned or pre-budgeted for this… more so than if you had just hired expert kitchen installers in the first place. Also beware, if an unlicensed person tinkers with plumbing or wiring in your kitchen and something goes wrong, your insurance won’t cover it… not to mention, you put you and your family’s safety at risk. At Express Kitchens, we believe safety should be your number one priority. If you are inexperienced or don’t hold any formal trades qualifications, don’t risk it. Hire experienced kitchen installers to do the job for you, or at the least, make sure you have pre-organised all the necessary tradespersons to be ready to go if and when you should need them. If you are determined to go the DIY option and have lots of experience doing home renos, then we highly recommend you’ve gone through a detailed planning process. Make sure you plan for anything and everything that could possibly go wrong, in addition to everything you anticipate needing. Which Option Saves More Money? Most people are under the impression DIY is cheaper… and while this can sometimes be the case if you are experienced and know what you’re doing, this assumption can also be misleading. Without the right experience and advice, DIY jobs can often be of much lower quality, which means the job won’t last as long. 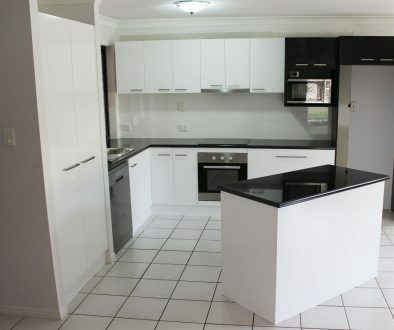 You may end up spending more money overtime trying to achieve your dream kitchen then if you had just hired experienced kitchen installers upfront. We get it, kitchen renos can be costly upfront. That’s why some professional kitchen installers like Express Kitchen offer flexible finance options, so you can choose the professional route without putting pressure on your bank account. Short-Term Solution or Long-Term Gain? If you are looking for a solution that’s going to stand the test of time, we always recommend hiring experienced kitchen installers who have a track record for quality kitchen renos. If you only require a temporary fix with the intention to pursue a longer term renovation solution later on, then DIY could be a good temporary option. Just make sure your short-term fix doesn’t risk covering up damage that gets worse over time… as this could end up costing more to fix when you finally decide to pursue a longer-term solution. 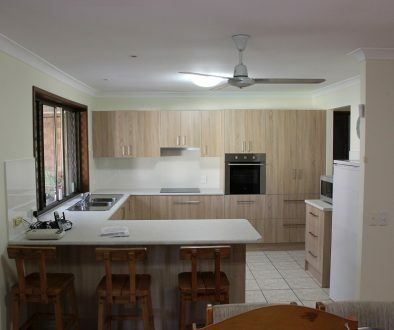 At Express Kitchens, we offer Brisbane residents, and coast to coast, affordable kitchen renovations, including our 1-Day Kitchen Install, all carried out by experienced kitchen installers. If cost is a concern, check out our Interest Free Finance options? 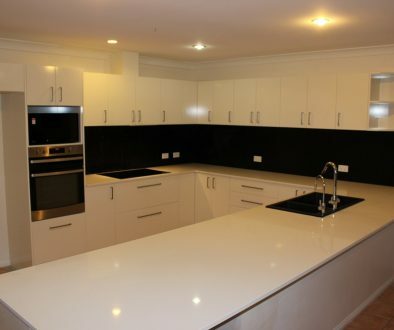 At Express Kitchen we aim to be the go-to experts for experienced kitchen installers in Brisbane and surrounds, helping you create your dream kitchen quickly at a price you can afford. Call us today for your FREE in-home 3-D custom kitchen design. After all, every great kitchen begins with a great design.